The Maplex Label Engine Boundary placement style places labels around the polygon, within its perimeter, usually matching labels of adjoining polygons. You can specify a repetition interval to repeat the label along the length of the boundary and specify an offset distance from the boundary to place the label. If there is not an adjacent polygon, a label will not be placed unless the Allow single sided boundary labeling option is checked. Allow single sided boundary labeling—This option allows a label to be placed on the polygon boundary if there is not an adjacent polygon. Centered position on line—This option is only available when the Allow single sided boundary labeling check box is checked. When this option is used, the label will be placed centered on the single-sided boundary. When there is an adjacent polygon, the labels will be placed offset from the boundary. Allow boundary labeling of polygon holes—This option allows a label to be placed along the boundary of a polygon hole where there is an interior polygon. It is checked by default. To label a polygon hole where there is no interior polygon, the Allow single sided boundary labeling option must also be checked. 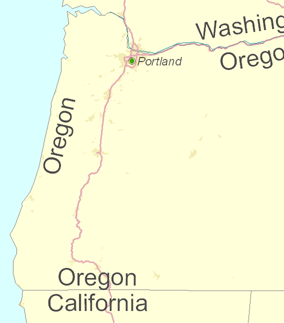 The following image shows the states of Washington, Oregon, and California labeled with the Boundary placement style. The Allow single sided boundary labeling option has been enabled. To label polygon holes, check the Allow boundary labeling of polygon holes check box. The following townships image illustrates this parameter. If the hole is empty, the Allow single sided boundary labeling check box must also be checked. Choose Boundary placement from the drop-down list. The label position will change to Place along boundary when you choose the Boundary placement style. This is because there is only one placement position for the Boundary placement style. Optionally check the Allow single sided boundary labeling check box. Optionally check the Centered position on line check box. This option is only available when the Allow single sided boundary labeling check box is checked. Optionally check the Allow boundary labeling of polygon holes check box.